"Helping people achieve and excel in their ambitions -in the right way." Purpose and Values are fundamental to EXCELLENCEA's long-term success and represent the set of standards under which all of us at EXCELLENCEA will work, and against which the performance of every employee will be assessed and rewarded. Our common purpose is to help people achieve and excel in their ambitions. We'll measure and reward our people, not just on commercial results, but on how they live our Values and bring them to life every day. Our Code of Conduct outlines the Values and Behaviors which govern our way of working across our business. It constitutes a reference point covering all aspects of colleagues' working relationships, specifically (but not exclusively) with other EXCELLENCEA employees, customers and clients, governments and regulators, business partners, suppliers, competitors and the broader community. The objective is to define the way we think, work and act at EXCELLENCEA to ensure we deliver against our Purpose of helping people to achieve and excel their ambitions - in the right way. EXCELLENCEA'sCode of Ethics is the foundation of our culture. Our Code sets forth those values and commitments that guide ethical decision making everywhere we do business. The Code strengthens our fight against corruption and promotes behavior that leads to the development of fair markets so that every company competes only on its merits. COMPETITIVE EXCELLENCE (CE) EXCELLENCEA's operating system focuses on the drivers of competitive excellence - our people and our work processes. Our leadership and empowered employees work together to implement CE practices in all of our activities across every EXCELLENCEA's business to benefit our customers and shareowners. 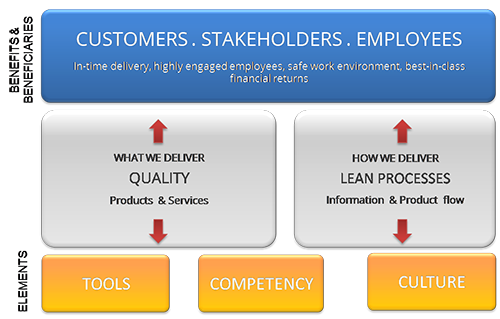 CE has three elements: culture, tools and competency. The daily interaction of each element is what makes it an operating system. Results focus on perfect quality, on-time delivery, highly engaged employees working in a safe environment, and best-in-class returns. We are committed to consistently delivering CE benefits to our customers, employees and shareholders. ?